Solve this math puzzle image if you are a genius. 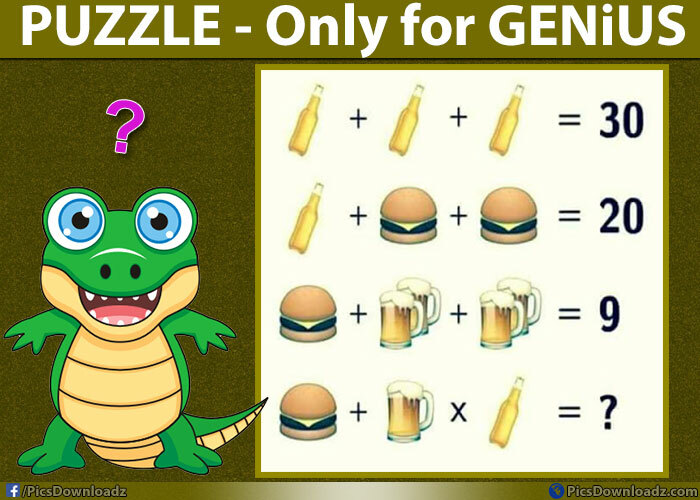 Only for geniuses puzzle image for facebook and Whatsapp! Hello, puzzles lover here is another viral facebook puzzle picture for you. Find the object’s value and check the details in this puzzle image and solve the last equation. Let see, how’s your math. Got it? Share your answer via comments. If you want to confirm your answer, check at the end of the post. Share this puzzle image with your friends on facebook or WhatsApp. Let see if they can solve this tricky math puzzle or not. 4) H + G × B = ? 4) H + G × B =? ⇒ 5 + 1 × 10 (Apply BODMAS Rule; Do Multiplication First) ⇒ 5 + 10 = 15 Ans. Banana + Cherry x Apple =?? COOL Math Puzzles Only For Geniuses! Brainteaser : What do you see in this Picture? Tricky Illusion Image!